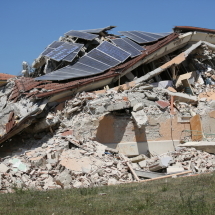 On August 24th, a strong earthquake with a magnitude greater than 6 Richter struck the center of Italy between the Sibillini Park and the Gran Sasso and Monti della Laga Park. 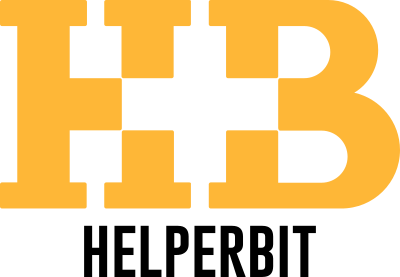 As you know, Helperbit is not yet live, but, while the other team member continued to work on the platform, I decided to go there to help,bringing food, and to tell you what’s going on. Wednesday 24th at night i get a message from my father: “Earthquake!”. Only four days before I took my parents on vacation in Sibillini Park, so I rushed immediately on Google Earth to see how much should I have been worried for them: I see that they are 25km far from the epicenter and during the phone call they tell me they’re fine, but, as all other customers, they will spend the night outside the hotel, as it is damaged. The 24th evening, at about 11 pm, I leave for Accumoli, a village perched between the mountains of Rieti. Every minute, along the street of 150km, I see, coming in the opposite direction, ambulances with flashing lights on but with siren off, while in the direction where I am going there is a long caravan of military vehicles, carrying large independent lighting system, in order to facilitate the digging out during the night. 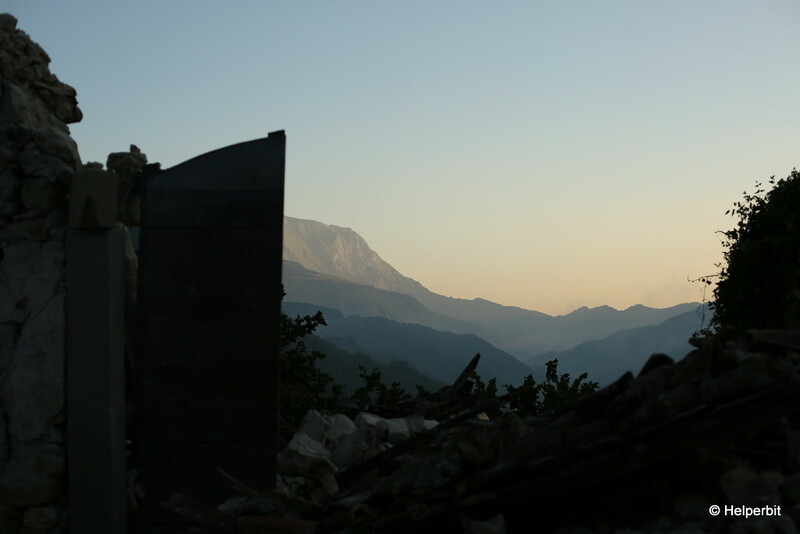 The first things that stand out, reaching an area affected by an earthquake at night, are the fogged windows of the cars: all survivors are sleeping in their cars for the fear of aftershocks. 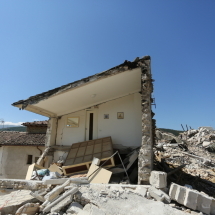 Come near Accumoli, I walk to Illica, but the street is interrupted due to ruins, here no one is working because it is a small village with 16 people during winter, so everyone knows each other and the count of the survivors is quick: the uninhabitable village recorded 6 deaths. I drive then to other villages: Grisciano, Spelonca, Colle, Poggio d’Api. It is dark, it is 3 am and I’m going to sleep in the back of my car. After 5 am, I wake up due to a new seismic tremor; the sun is rising so I decide to park the car in order to not be an obstruction for emergency vehicles, which are starting again the relief activities. Two old people, looking in the void, stay warm in their car next to their house; they are aware that there will never live again in that building. 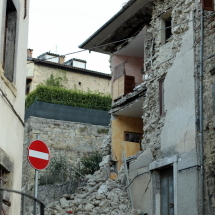 I arrive at Accumuli through the trail “Italia”: the first house is completely gutted, the roof stands on anything. Inside the building I can see mattresses sunken into the lower floors and paintings hanging on the remaining walls, while on one side of the wall there are tiles that suggest that previously there were two different rooms, separated by a wall now collapsed. Entering the village, the landscape that appears in front of me leaves me speechless: the luckiest cars are only covered by a thick layer of dust created few hours before due to ruins, the others are totally crushed by rubble. 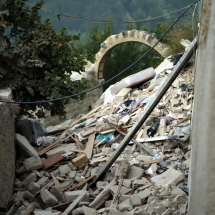 Accumoli increase the number of fatalities with 11 dead people. While I walk away, I notice that the Swedish press is asking two old men, who were there on holiday, to pose next to the car where they slept, and with the background of the dawn; perhaps excited to be interviewed, they just make big smiles, while the Swedish journalist does not know how to explain them that she wants a sad look. Set aside this scene, I walk out of the village and I am surprised for the geometry of some walls, totally in precarious balance, that stands only thanks to the electric cable that passes around the house. There is a deer grazing just few dozen meters from the road, nothing has changed for him. 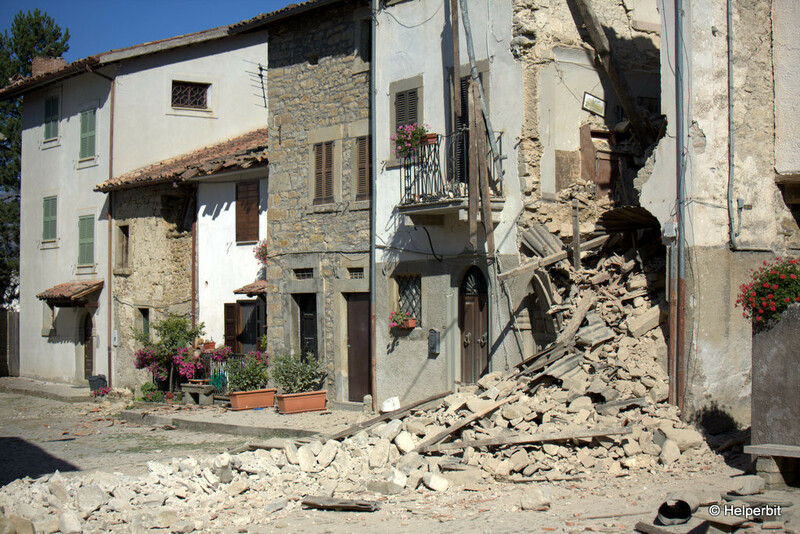 As I walk along the road that leads to Via Salaria, a car stops; the driver is Mattia, a professional photographer arrived from the north of Italy to document the catastrophe, asking me if I want a ride. 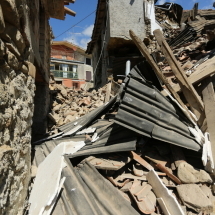 He said he was in Pescara del Tronto and that the village is totally destroyed, and talks about his memories of the earthquake in Tibet few years ago, when he lived in China, similarities and differences of such tragedies: in that case the victims were thousands, as there were not sniffer dogs and the epicenter was thousands of kilometers by rescue units. 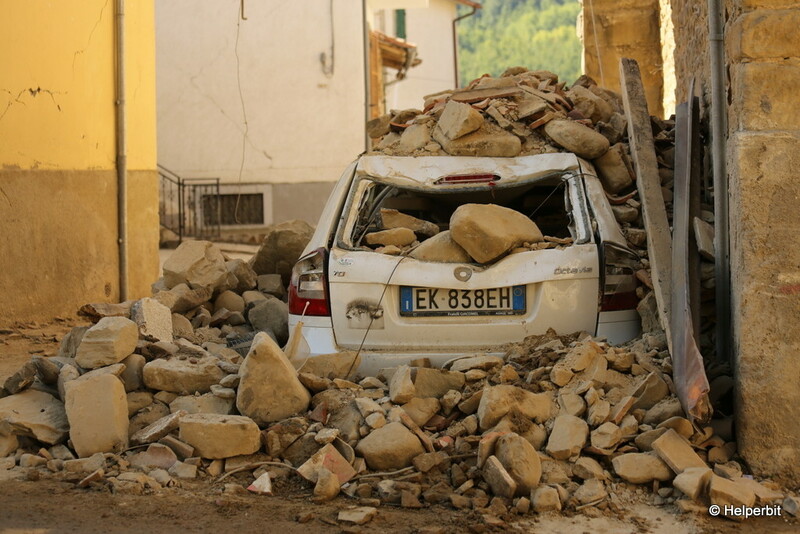 Together we go to Amatrice; unlike other cities, here is the maximum of emergency assistance. 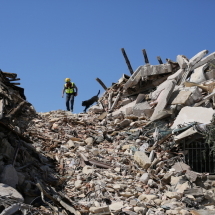 The hospital is severely damaged and few meters ahead there is a bulldozer digging, surrounded by hundreds of people who watch it; at the beginning the bulldozer tries to remove carefully the ruins, then, once it stops, the dog sniff out a human trail into the debris. The eyes are entirely focused on the dog, but no signal is captured; it is again the turn of the bulldozer. Then we go to Prato village, a kilometer in north direction. There are a dozen people outside a house, the owner came back to take the TV and they are watching it on the street. They have not asked for help because they were not in an emergency situation, but now they live in a metal box with inflatable mattresses and blankets. 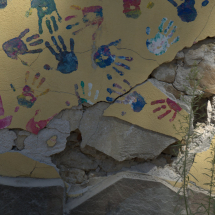 The night was cold with 10 Celsius degrees and Giuseppina explains her drama: they are lucky to be alive, but their home is damaged and, knowing what happened to L’Aquila, they are afraid of the situation in the next winter. Marta instead is 82 years old, I tighten strongly her hand and keep tightening it during her narrative, her other hand holds a bag of medicine. She says openly: “I need comfort.” A disarming request. Needless explain her that, just 3 km away, the civil protection has set up camps where she can receive food, medicines, attention; the lady does not want to get away from there. In that moment it’s very sunny and, for protect herself, she was leaning against the house, visibly unsafe. The love for her home is so strong and I try to understand it, but it’s hard. 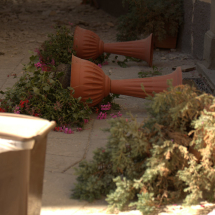 Another village, another drama: in Retrosi an old lady i scrying and arguing with her daughter, who tries to explain her the luck to be alive; they repeat the same phrases several times, while the husband moves the food into a bin and puts it safe. Coming back in Amatrice, I am impressed by the amount of vehicles: all the Italian rescue teams are here and continues to arrive. We talk with Andrea, the head of the communications in the camp; he tells us that only there they have already set up 250 beds and they are finalizing the sewers and the picnic area for children. 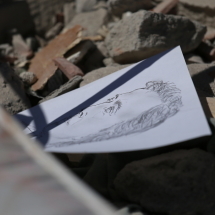 In a side square there is a dark car with clear damages caused by ruins, but no without rubble, and it has been put in the center of the square for the mass media. Almost to street level, we see a mansard; I ask to people in that area how high was the building, they say six floors. 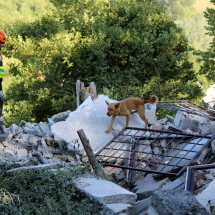 The bulldozer works near the sniffing dogs, while in a public garden under the trees there are groups of the mountain and caving rescue, families without a home, journalists from various nations that write, film and photograph the landscape. In another street there is another group of people, Mattia ask information and come back telling me that is the space for the police, there are families who wait for the identification of bodies. 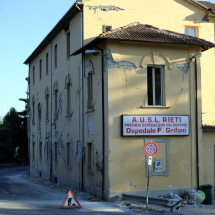 A little further on there is the school: there are two collapsed floors of the school complex Romulus Capranica, classrooms, a hall, the bell on the ground; on the opposite side of the garden there is still the panel that praised the 2012 seismic restructuring, no comment. Let’s go back to the north, to the villages. 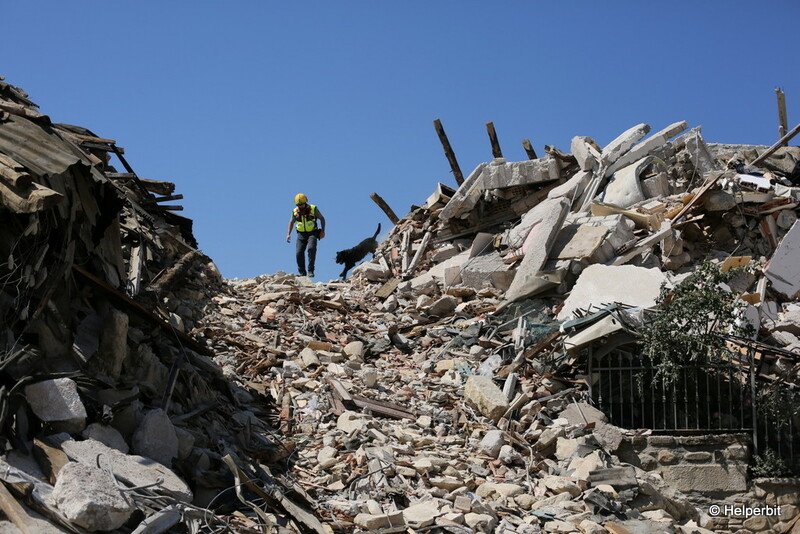 Saletta is appalling, I have no idea how these buildings were high, but the rubble reaches the sky. Here, 50% died, only 22 survived out of 44 inhabitants. 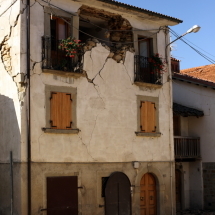 A house with the writing “MMXVI” is perfectly in good conditions, showing that proper housing can easily face an earthquake of Richter magnitude equal to 6 in Italy. I sit down, I take off my helmet and get to talk to the forest service, arrived with the dogs and using the helicopter. 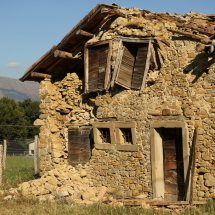 Then a short but strong seismic tremor suggests us to run away from the walls and reminds us that it is not over yet. In Illica i end the travel of the day, while the Association of Italian Chefs are preparing the next meal, a peasant complains about the excess of water and the lack of wine, many people laugh about this conversation and fortunately those affected people have still the desire to joke. Friday August 26th, 2016 Thursday February 23rd, 2017 dakkComments are off for this post.